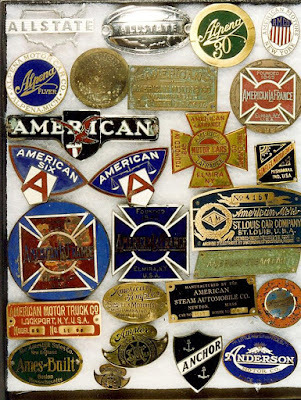 Most of the early American motor vehicles have long since disappeared, having been disposed of in junk yards and car wreckers yards or left to decay in the countryside, but many of their names have been preserved by emblem and nameplate collectors. Radiator nameplates, emblems, tags and related automotive items became collectable many years ago. Given the importance of the motor vehicle and the large number of motor vehicle manufacturers in the early years of the automotive industry in America, it is likely that the hobby of collecting and displaying automotive radiator emblems began at least by the 1920’s. 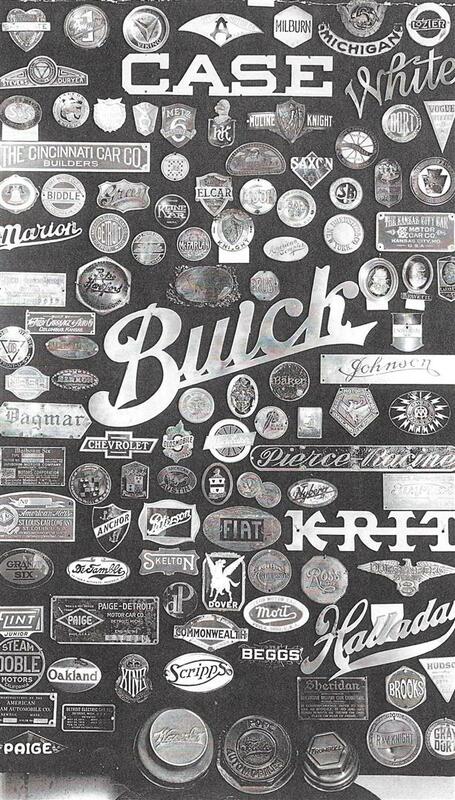 The summer 1957 edition of The Antique Automobile illustrates part of the emblem collection of Tony Weber of Mankato, Minnesota, who claimed to have started collecting emblems in 1915. 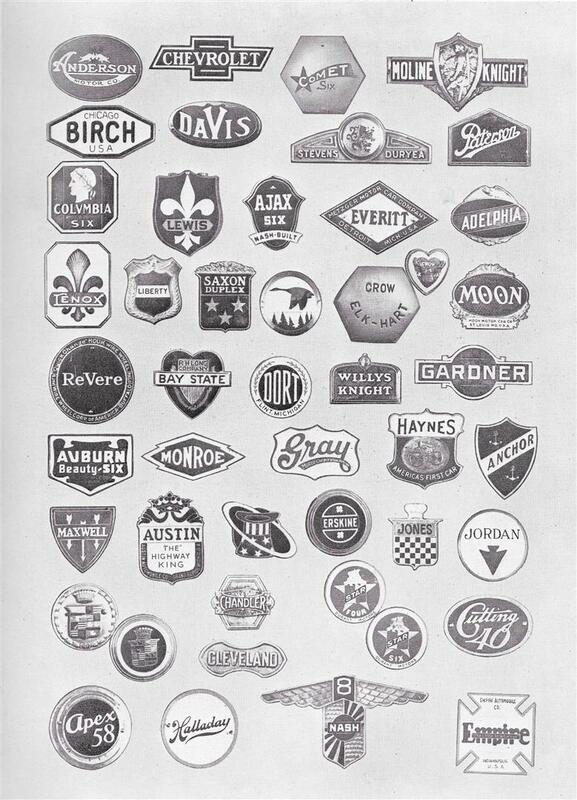 Certainly there were major collections of emblems in America in the 1930’s. One was the emblem collection of W Emmert Swigart, who had arranged for several junk yards and auto wreckers yards in Pennsylvania to save auto emblems for him in the 1930's. By 1939, he was mailing reply cards to members of the then newly established Horseless Carriage Club of America, or HCCA, noting that he was a "collector of automobile name plates" and "desired nameplates of automobiles, especially older and rarer models and kinds". At the same time in 1939, the HCCA invited its members to complete a check list indicating their interests. 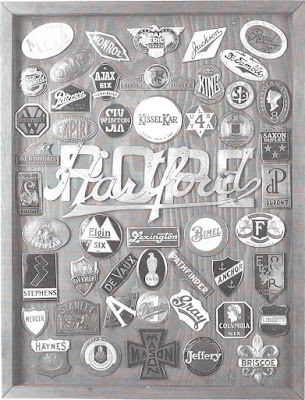 At the top of the list was "Radiator Emblem and Ornament Collecting", indicating that this was a popular pastime even in the 1930's. The November 1936 Annual Motor Show Number of MoToR Magazine has an illustrated article about an impressive collection of emblems, including many very rare pieces, put together by William M Ryan of General Motors based in San Francisco. It is not certain what happened to this major collection of auto emblems but I have had the privilege and pleasure of cataloging the Swigart emblem collection and I have found examples of all the rare emblems in the William M Ryan collection in the Swigart collection, with several of these emblems displayed close together on the same board. It is highly likely that the William M Ryan collection was acquired by W Emmert Swigart. There are other examples of major emblem collections from the 1930's and later. 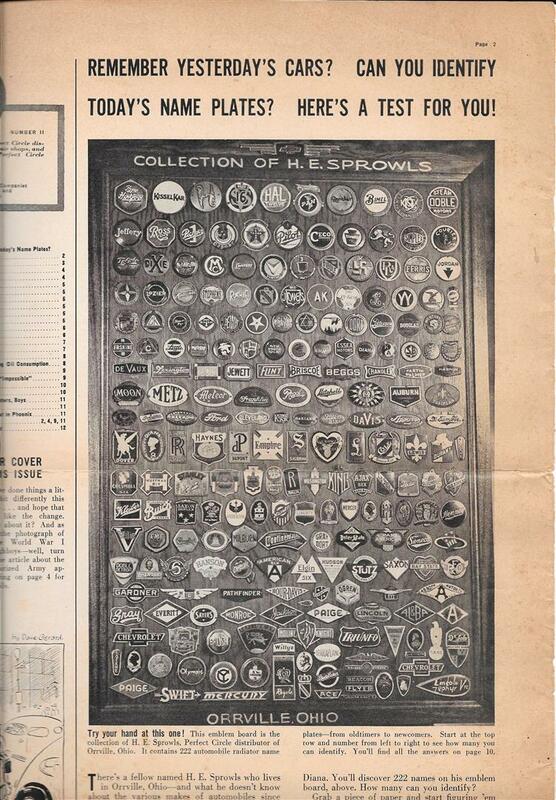 The May 1943 edition of Magic Circle, for example, shows the emblem collection of H E Sprowls of Orrville, Ohio. 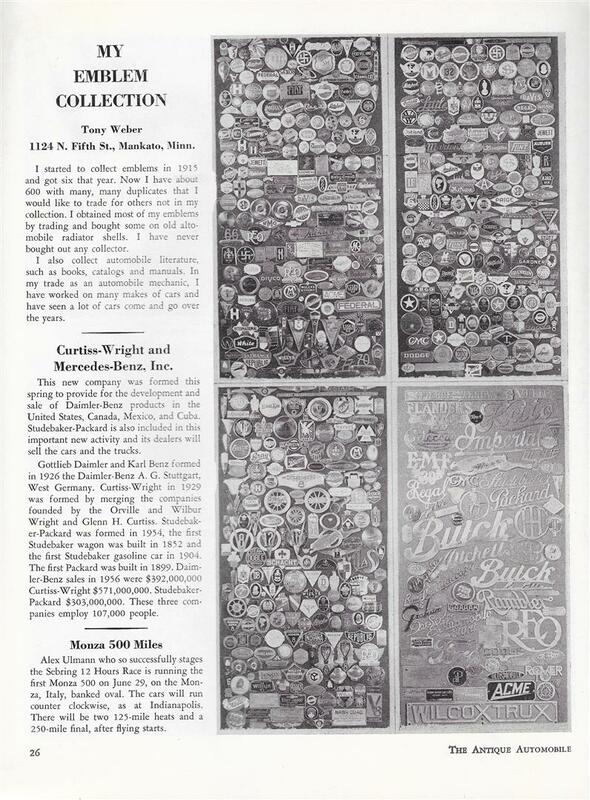 In February 1944, Westways magazine featured the emblem collection of Edward J Blackwell of Glendale, California, which included over 1000 pieces and 350 makes. In 1946, the Eaton Manufacturing Company of Cleveland, Ohio published “A Chronicle of the Automotive Industry In America 1893-1946” as a salute to the Golden Jubilee of the American Automotive Industry. In it are four displays of emblems from the collection of Harry W Bell of Natick, Massachusetts, which had been exhibited at the Museum of Science and Industry in Chicago and displayed at the American Automotive Industry Golden Jubilee in Detroit earlier in 1946. The Harry Bell emblem collection was also shown in Philadelphia in 1949 at the Philadelphia Auto Show and National Antique Auto Show. 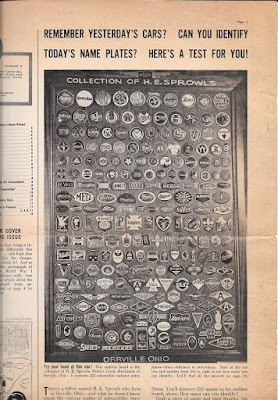 The Auto Show brochure includes some of the emblems on display and suggests that the collection and was “probably the largest and finest in the world” at the time. 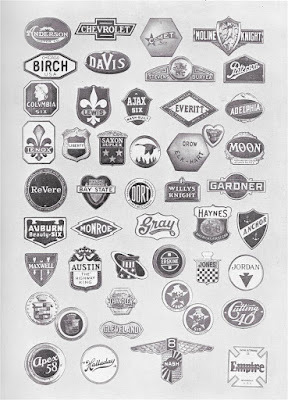 Other major emblem collections photographed in the 1940’s include those of H C Stockwell of Hutchinson, Kansas, L E Parsons of Cleveland, Ohio and F L W Combs. 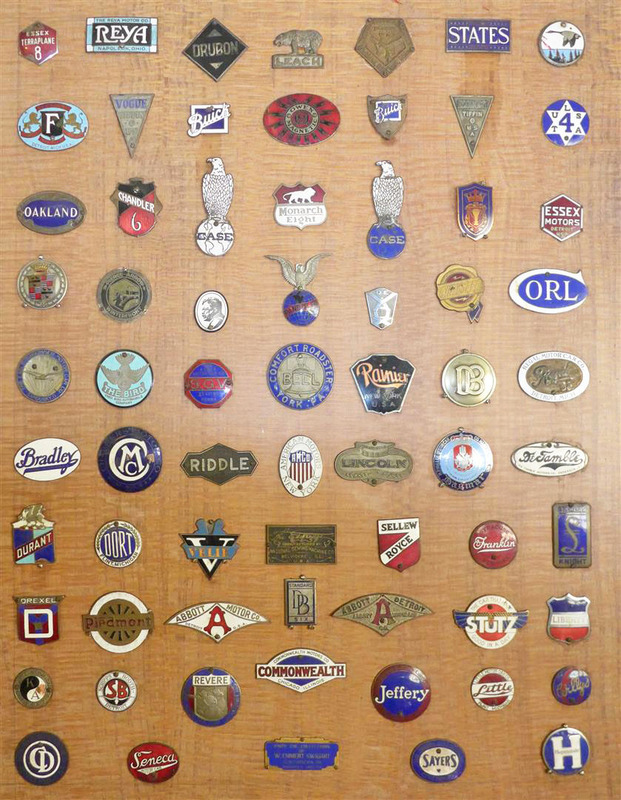 Emblem collecting became really popular from the 1950’s, particularly with the growth of antique auto meets and flea markets. 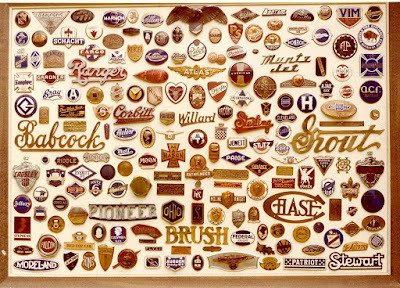 In 1951, the Eaton Manufacturing Company produced a large poster or wall chart containing photographs of 556 auto emblems as a valuable reference to emblem collectors. 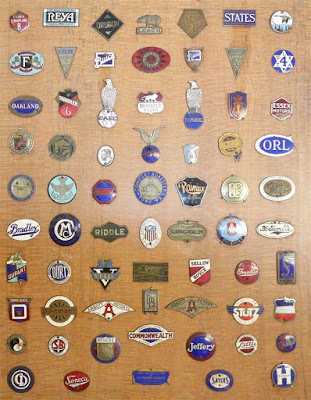 Harry Pulfer of Pasadena, California was a major collector of emblems and did much to encourage interest in collecting with his publications “The Auto Name Plate Collector” and his “Emblem Survey”, which described many rare emblems probably for the first time. 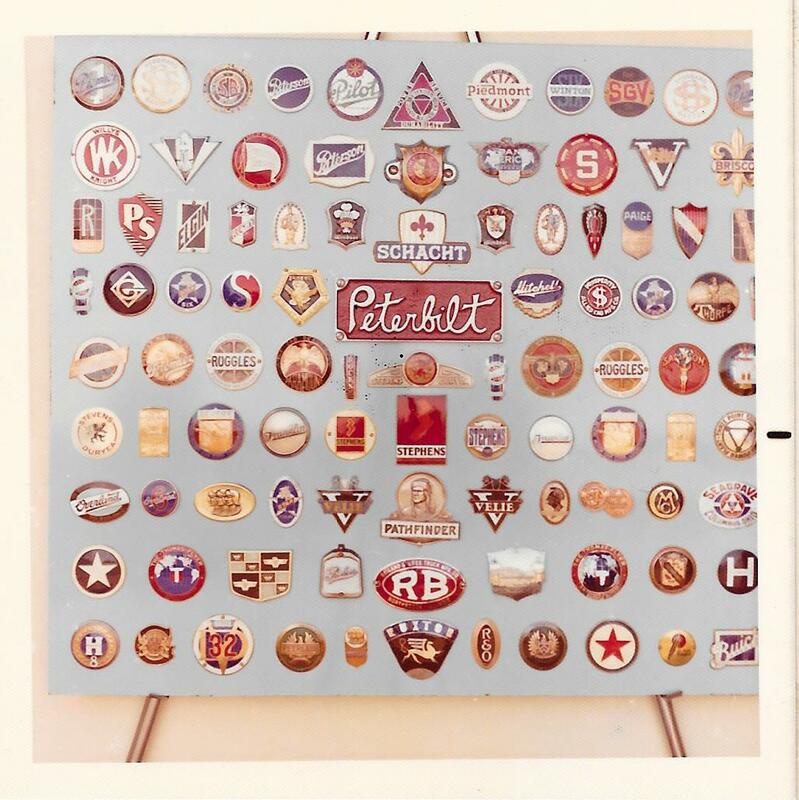 Pulfer referred to the main emblem collectors in America in the 1960’s, including Al Thurn, Cy Kruger, John Webster and John Weis. The Al Thurn emblem collection was one of the largest of such collections and was mounted on 58 large display boards, see example below. 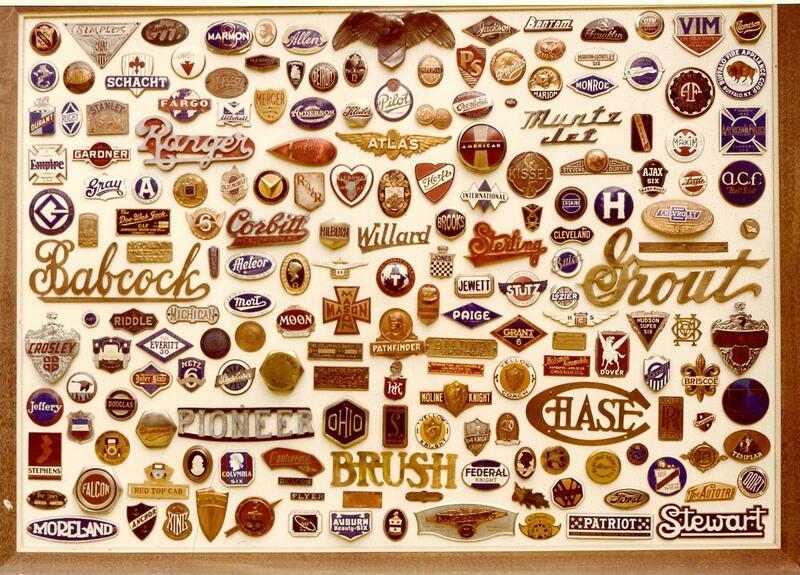 In 1964, Hubert G. Larson donated a collection of 278 radiator emblems to the Smithsonian Institute. This collection is not on public display but the individual emblems can be viewed on the internet. Other collections have also been donated to auto museums, including the Crawford Auto & Aviation Museum in Cleveland, Ohio and the Gilmore Car Museum at Hickory Corners in Michigan. 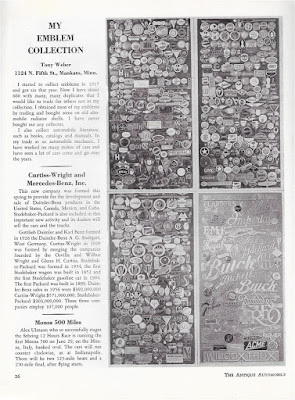 Auto magazines over the next decade or two regularly included articles on emblem collecting written by collectors such as Karl Zahm, Stew Reamer and others. Emblem collecting continued to grow through this period. 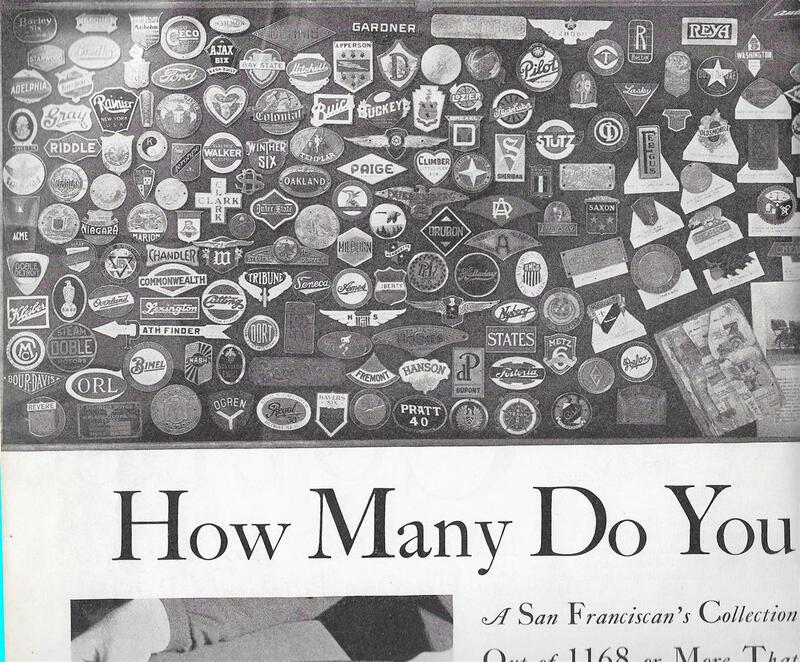 In the 1990's, truck emblem collector, Leigh Knudson, established an Emblem Collectors Association and produced yearly issues of his Emblem Collector's News. Members of the Association met at the AACA Fall Swap Meet at Hershey. Emblem collecting has not diminished over the following twenty years to the present time and has the potential to continue for many years to come. Was there ever a perfect time for emblem collectors? Between the World Wars people were not as mobile as they became after the Second World War, and there were less opportunities to find emblems. Probably the best sources in the early days of collecting were car wrecker yards. In the period following WW2, there was a growth in flea markets and in collecting generally. One of the best ways to develop a collection was, and still is, to trade with or buy duplicate emblems from fellow collectors. 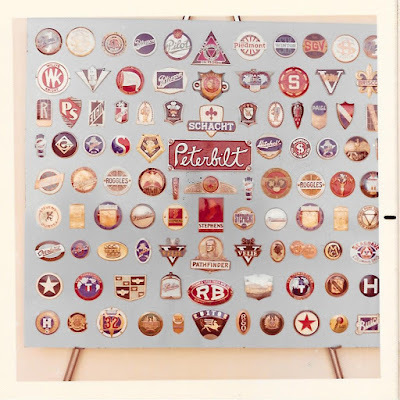 The correspondence files kept by emblem collector John Weis show that, even in the late 1960’s, emblem collectors were already complaining that it was no longer possible to find emblems unless another collector decided to dispose of a collection. Emblem collectors say the same thing today some sixty years later. It is true that many emblems are locked in private collections. However, they do eventually find their way into the market. 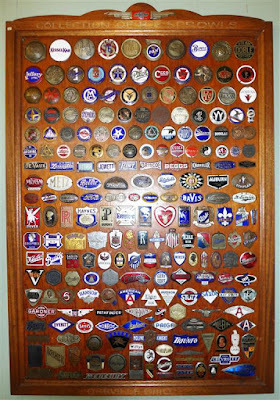 For example, the famous Al Thurn emblem collection put together in the 1950’s and 1960’s was eventually sold to fellow collector, John Weis. John Weis later broke up and sold his collection to other collectors, including John Webster. The main emblem collection of John Webster was sold on and now forms part of the Murray John Shears emblem collection. From time to time early emblem collections continue to come onto the open market and are dispersed. Important collections of emblems are put on sale at well-advertised auctions. 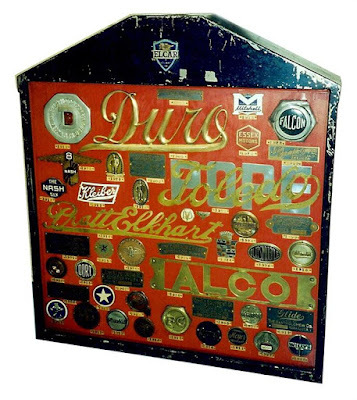 Examples of the sale of major emblem collections in recent times include the S.Ray Miller Auto Museum sale at Elkhart, Indiana in 2004 and the Lee Roy Hartung collection sold at Glenview, Illinois in 2011. Auto emblems can still be found at swap meets and individual emblems are regularly offered for sale on the internet. In this regard, emblem collecting may be easier today than before with better communications and access to information becoming ever easier using the internet. Certainly there are many active emblem collectors today, as can be witnessed by the wide interest shown in rare emblems for sale on the internet. Emblem collecting has been greatly assisted in recent years by the growth in images of emblems available on the internet. One of the most valuable sources of images of very rare emblems is the amazing website of Claus Wulff to be found at www.radiatoremblems.com. Similarly, I hope that my own website will help to encourage a deeper interest in auto emblem collecting. Auto manufacturers also continue to produce new designs of emblems, so the hobby can remain alive for as long as there are motor vehicle manufacturers. Emblem collections can be displayed in a variety of ways. In many early emblem displays, the emblem was attached to a display board by screws fixed through holes drilled through the emblem. This method offers the advantage of security and ease of attachment but the obvious disadvantage of damage to the emblem. A further problem with displaying emblems on boards is that the original fixing devices and manufacturer’s marks on the back of the emblem cannot be seen. An alternative means of displaying emblems is to lay them flat in display trays. This has the added advantage of allowing a relatively easy means of changing the arrangement of a display. Grading the rarity of auto emblems is difficult, as there is no established way to do this and there is insufficient data on the actual numbers of particular emblems that were made and how many still exist today. We would need to have detailed inventories of all emblem collections to have any real chance to reach a definitive assessment of true rarity. This is unlikely to be possible and does not help a new collector, as an emblem that exists in large numbers and may be regarded as relatively common is in fact very hard to find if all the emblems are held in emblem collections. An example of this is the first Dagmar emblem used in 1922-1924. About twenty years ago, this emblem was relatively easy to find, as a number of new old stock emblems had been found. However, today they are difficult to find, because these emblems are now held in many individual emblem collections. Emblem collector, Claus Wulff uses an interesting five star grading system for the emblems shown in his www.radiatoremblems.com web site based on his assessment of the "financial value" of emblems. However, "financial value" is variable and time dependent. A few wealthy emblem collectors bidding for a rare emblem can push the winning bid to very high levels but when these collectors have each been satisfied after subsequent auctions, the "financial value" of yet another similar emblem is very much reduced. Also, the use of "financial value" does not always reflect rarity. For example, enamel radiator emblems often command a higher "financial value" in the market place compared with a much rarer brass auto makers plate. Also, many emblem collectors prefer emblems used for passenger cars to commercial vehicle emblems and this affects their view of "financial value". No comment - emblems or nameplates that I judge to be relatively easy to find. Scarce - emblems or nameplates that are not particularly rare but are becoming difficult to find. Rare - emblems or nameplates that are difficult to find but are out there somewhere. Very rare - emblems or nameplates that are very difficult to find outside established emblem collections. Extremely rare - emblems or nameplates that are almost impossible to find, as very few exist and only in established emblem collections. Ultra rare - emblems or nameplates that are so rare that only one, two or three are likely to exist. I accept that my assessment of rarity is also subjective and open to comment but it is the best I can do at this time. I would very much welcome your views on the subject of the rarity of emblems. Collectors of original emblems need to be wary of reproduction emblems, of which there are many on the market and are included in collections made many years ago. 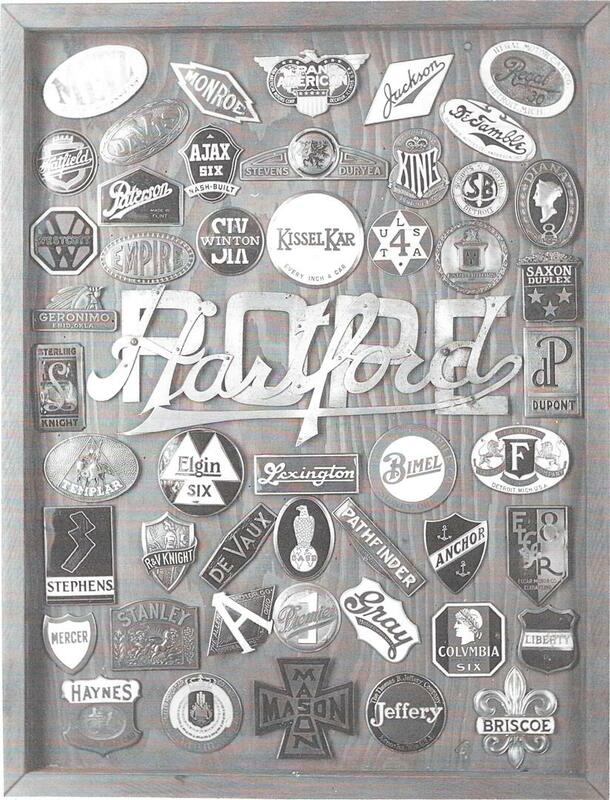 Harry Pulfer is well-known for the reproduction emblems that he traded in. 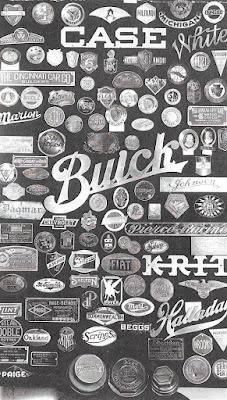 Pulfer had reproduction emblems made for use in restoring early automobiles and for collectors who may otherwise never find a rare emblem. Pulfer emblems were acid etched reproductions cheaply made in Hong Kong and an experienced collector can usually tell the difference between a Pulfer emblem and an original emblem, because of the somewhat cruder artwork, lack of detail in depth, flat back side, and cheaper quality material and finish. However, after fifty years, they can still fool some collectors when they are offered for sale as original emblems. Pulfer openly sold his emblems as reproductions and each emblem had an adhesive oval shaped sticker attached to the flat back side of the emblem saying “Made in Hong Kong”. In some cases Pulfer emblems still show discoloration where the sticker once was on the back. Many of the emblems produced by Pulfer were reasonably accurate reproductions of the original emblem but others were not, especially those rarer emblems where Pulfer had been unable to make an accurate rubbing of an emblem. In some cases, the Hong Kong manufacturer also made errors in their own interpretation of the designs and often the colors were not correct. The backs of these acid etched Pulfer emblems are flat and this can sometimes be taken to indicate a reproduction emblem but not always, as many early original emblems also had flat backs and no maker's mark. 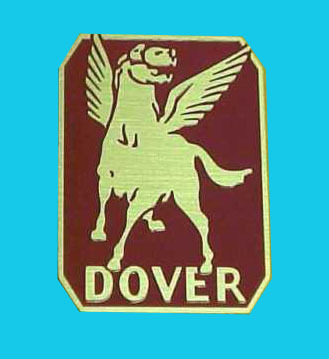 Although the term "Pulfer" is now commonly used to describe a reproduction emblem, not all reproduction emblems were made by Pulfer. 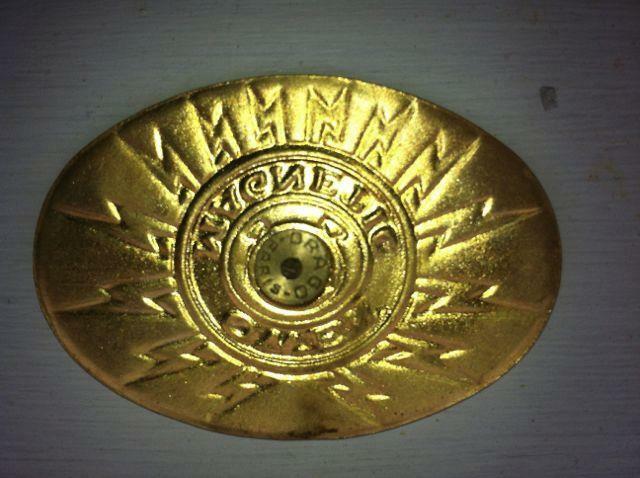 There were other makers of reproduction emblems and some used dies to mould the emblem and give greater depth of detail. The reproduction emblem shown below was made by pressing into a die. This gives the front better surface detail, so that it is not so easy to see that it is a reproduction, but the back of the emblem looks wrong. There were some makers of reproduction emblems who produced higher quality emblems. Sheldon Greenland, for example, produced a range of high quality emblems made with male and female dies. They carry no manufacturers mark and most have a small drilled and tapped stud on the reverse for mounting on a board, others have a threaded stud. These types of fixing stubs should be regarded with suspicion by collectors of original emblems but they do not guarantee that the emblem is a reproduction, as there were genuine original emblems which used very similar fixing studs. However, other emblems made by Nostalgic Reflections are of good quality but can usually be identified as reproductions because of the fixing attachments at the back of the emblem. Some are clearly stamped with the Nostalgic Reflections trademark. 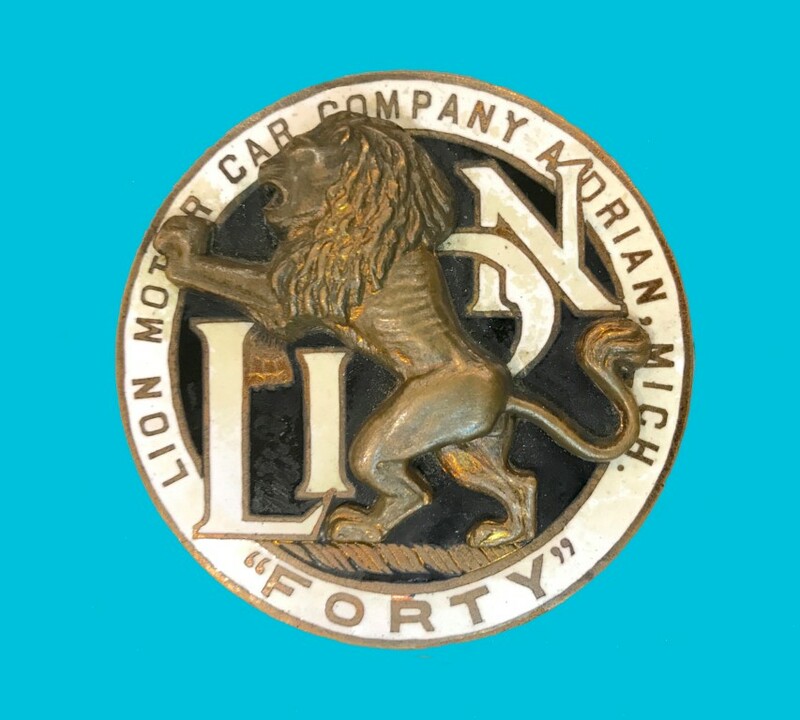 An experienced collector will consider the quality of the artwork and finish of an emblem, as well as the type and color of the enamel and the base metal, when assessing the originality of an early auto emblem. 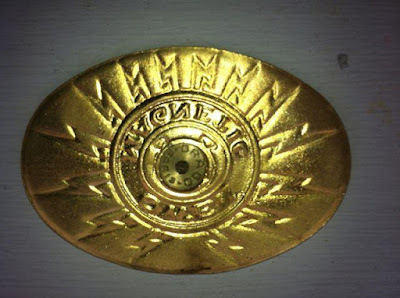 The existence of solder used to mount the emblem originally or traces of early fixing studs or cup washers may help to confirm an original emblem. The most obvious evidence of an original emblem is a mark, usually but not always, on the back of the emblem showing the name of the emblem manufacturer. 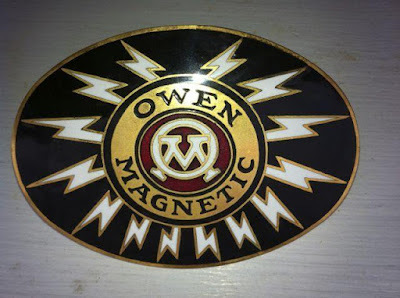 However, many original emblems did not carry a manufacturer’s mark and, where they did, solder or later mounting studs may have covered the mark. Further, more detailed information about emblem manufacturers is presented on the Emblem Manufacturers and their Marks page in this blog. Collectors of very rare and expensive emblems need to be particularly careful. There have been several examples of rare emblems that have been reproduced so well that it is very difficult to tell the difference from an original. These reproduction emblems are costly to make but, when prices for very rare emblems can be several hundred dollars or even over a thousand dollars, it becomes an economic prospect to make an accurate reproduction, even including the emblem manufacturer’s mark. The lack of authenticity of some reproductions is disguised by damage to the enamel and, in some cases, the addition of solder on the reverse side of the emblem, This will become an increasing risk as 3-D printing becomes more readily available as a tool for making accurate dies for reproductions. It is particularly difficult to tell whether a brass radiator script is original, although a few of these scripts did carry a patent mark or a maker’s mark. Very early radiator scripts were often made of cast brass and were attached to the radiator core by long, small diameter rods screwed into the back of the cast script and held in place by a backing plate behind the core. The fixing devices of these early cast scripts can help to identify an original script. Later scripts were made of flat brass or aluminum plate attached to the radiator core either by soldering directly to the front of the core or by soldering wires to the back of the script and passing these through the core. Other scripts had holes or lugs to which the fixing rods or wires were attached. 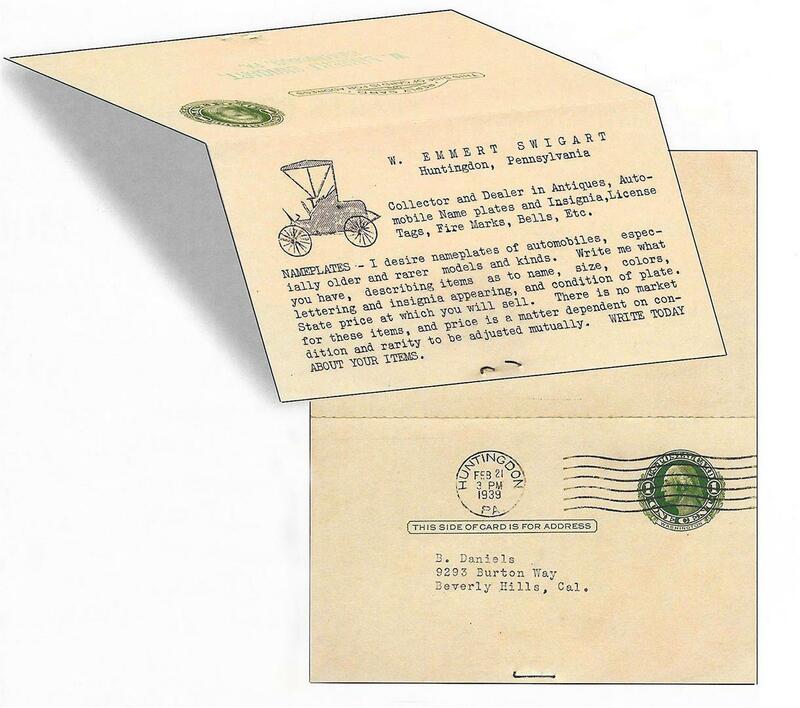 Radiator script was not always fitted by the vehicle manufacturer but was sometimes available as an optional attachment available from the vehicle manufacturer or another supplier. In some cases, the original owners of early vehicles had the radiator script made in local workshops. Radiator script can be reproduced relatively easily and accurately. The late Arthur Evans made high quality radiator script for vehicle restoration and examples of his scripts are displayed at the AACA Automobile Museum in Hershey, Pennsylvania. Some collectors will only keep emblems that are in original, as found condition, preferring to show the surface patena that develops with age and handling, even with some minor loss of enamel or surface scratching. Original unused, new old stock emblems are also highly regarded by collectors. However, many emblems that have been used on a vehicle will be damaged in some way, either suffered during use or caused by the process of removal from the vehicle. Damaged emblems can often be restored, including those finished in glass enamel. Minor damage to the glass enamel may be improved by painting with paint used in model making or even colored nail varnish. Badly damaged emblems may need to be straightened and have the remaining glass enamel removed and replaced. The restoration process is highly skilled and can be expensive but may be worthwhile for unusual or rare emblems that are badly disfigured. Most colors used in the production of emblems using glass enamel can be reproduced but for some colors this is no longer possible. For example, the deep blue glass enamel used for many early emblems was produced using a cobalt compound containing arsenic to improve bonding with the underlying metal. This type of glass powder is no longer available due to its toxic properties and the deep blue finish cannot be accurately reproduced.